Grover told Jordan than when you focus on the competition, you give them power. You waste your focus on them — what they’re doing, how to keep up, how to counter their moves. Instead, Grover told Jordan: there is no competition. Focus on winning, and everyone will be trying to keep up with you. Let them waste energy trying to get in your head and mess you up. You don’t need to be a professional athlete or Fortune 500 CEO to use this strategy. You’re going to encounter obstacles and competition in any endeavor; many times, those individuals will actively try to stop you and beat you for the reward — a promotion, a cute guy, a spot at the table. But the way to win isn’t to beat the competition — the way to win is to focus on winning. The rest takes care of itself. Competitors Focus on Keeping Up With the Winners. Winners Just Focus on Winning. 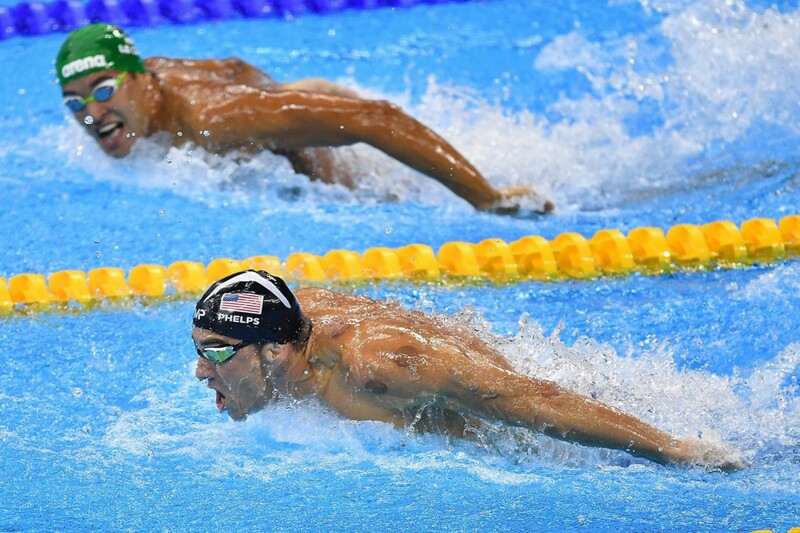 In the 2016 Rio Olympics, all eyes were on the Michael Phelps and Chad Le Clos in the 200-meter butterfly final. In 2012, Le Clos had beaten Phelps in the exact same race, which was monumental — the butterfly was Phelp’s race, and everyone knew it. Phelps had won the gold in both 2004 and 2008 (not to mention 2 more golds in the 100-meter butterfly each year, too). Until Le Clos dethroned the champ. Phelps was shaken, and amid the media frenzy of his failure to clinch the gold again, he announced his official retirement from the Olympics. Still, he couldn’t stay away — Phelps came out of retirement. Le Clos had some choice words about Phelps, criticizing his attitude and bragging that he still had a faster time than Phelps. “I just did a time he hasn’t done in four years,” he boasted when pressed by reporters. The 200-meter butterfly final of the 2016 Olympics finally arrived. Phelps won first place. Le Clos came in 2nd. Competitors focus on keeping up with the winners. But winners just focus on winning. In his book Good to Great, Jim Collins and his team spent years studying companies that were able to make the leap and enter the top of their field — and stay there. Frankly, I have a hard time with this. As a writer/entrepreneur, it’s easy to get caught up in what my competition is doing. I’ve spent more time than I’d like to admit worrying about “keeping up” with other, better Medium writers. But I’ve found the most focus, calm, and enjoyment when I just write and create what I want. When you let others call the shots, you’re guaranteed to waste lots of time living reactively. But when you focus on doing what you need to do to, you stop living reactively and start living life on your terms. You’re going to confront a lot of stress and high-pressure situations in your life. You can remain calm with this simple tool: remembering that pressure isn’t real. I know what you’re thinking — just keep reading. Pressure is just the stress you put on yourself. But you don’t have to put anything on yourself. Seem pressure is the result of limitations we put on ourselves to produce outcomes we don’t control. When we focus on the outcome, we begin to expect things out of our control, which sets us up for failure. Back when I used to work as a telemarketer, I was under extreme stress every day. I was making 250+ calls a day to random strangers (most of whom had already told me “No, I don’t want to buy your products, stop calling me.”). After months of this, I began to believe a false reality: that I could make people buy something. If only I said the right thing, in the right way, at the right time. At least, that’s what my boss claimed. I wasn’t until nearly 2 years later I finally quit that awful job and left my manipulative boss that I realized: “That’s not true. I can’t make anyone do anything.” All that pressure I had been putting on myself was imagined. I had made it all up in some sick effort to “motivate” myself. You don’t need to pressure yourself to compete, to win, to come out on top. Because the truth is, you don’t control the outcome. You don’t control anything — except yourself. The only parts you truly have control over areyour attitude, your mindset, and your actions. The rest is out of your control. The higher your expectations — for your job, the people around you, the outcome — the lower your serenity. The more you expect things to happen in ways you don’t control, the more stress and pressure you’ll experience. This is a hard lesson. I don’t expect many people to get it right away. I’ve heard that phrase for years and still have a hard time with it. That’s OK. Fundamental mindset shifts like this take time. If it doesn’t make sense now, don’t worry about. If there’s one thing I encourage you to consider: pressure is imagined. You don’t control the outcome, so don’t even try. Instead, focus on what you can control: yourself, your attitude, and your actions. Once you understand pressure is imagined, nothing can phase you on your path to mastery. You can achieve enormous goals with simple ease. You Don’t Get Satisfaction By Beating Someone Else. You Get Satisfaction By Winning With Your Values. But take it from me — I’m one of the most competitive guys I know. Ever heard of the Strengthsfinder personality test? Out of 34 possible strengths, my #1 strength was competition. But I’ve found that in serious matters — career, relationships, health — “beating someone else” doesn’t feel as good as simply living rightly in my own eyes. That thing you’re striving for — a closed deal, a promotion, a new lifestyle, more freedom — you can get it, but it won’t feel as good if you’re not acting rightly in your own eyes. Achievement is empty if it comes outside your internal values. When you’re faced with stress and difficult people trying to bring you down, it’s easy to slip into a mercenary, I’m-going-to-beat-you mentality. But often, this mindset hurts you in the long run. Even if you win, you did what you did because of them. But was it what you wanted? Of course, to have both would be great. But if you had to choose one or the other, what option aligns with your values? For me, it’s feeling it. Living aligned with your values will give you much more peace, serenity, focus, and energy. How do you keep a cool head when your competition is trying to rattle you? Best-selling author Seth Godin once advised that in order to solve a problem, make that problem obsolete. Redefine the rules of the game: take the power away from your competition by deciding they aren’t your competitors. They’re just people doing their own thing. Don’t permit others to slow you down. Eventually their scheming and attempts to sabotage you will blow up in their face if you stop focusing on them and start focusing on winning. You don’t compete with anybody. Make everybody compete with you.